After Moses died, Joshua led the people of Israel in their journey to the Promised Land. Joshua sent two spies to explore the city of Jericho and learn what they could. The two spies entered the city and stayed at a public inn. This inn was run by a woman named Rahab, who was not a very good woman. The the spies’ visit, however, changed her life. The king of Jericho found out about the spies. However, when he ordered Rahab not to house them she hid the two men on the roof and told the king that they had already left. Rahab told the men that she knew God had given the Israelites the land of Jericho. She talked about the great deeds God had worked for the Israelites and asked that her family be spared when the Israelites conquered the city. The two men agreed to her request because of the assistance she gave them. At night, the two spies escaped from Jericho. Rahab told them to go into the hills and hide for three days and then to go back to the Israelite camp. They told her to tie a red cord in her window so that when they conquered the city, they would see the red cord and spare her family. After the Israelites conquered Jericho, the two spies brought Rahab and her family outside of the city before it was destroyed because she kept her promise to the spies and helped them escape. Because of this the two men also kept their promise and spared her family. The red cord in the window saved Rahab’s family from destruction. This can represent the Blood of Christ that saves us from our sins. James emphasizes that “faith without works is dead.” We must put our faith into action no matter what the price may be. The story of Rahab should teach us that no person is ever too bad for God’s Mercy. When we think of this story, let us remember the shepherd of all souls – Jesus – who searches for the lost in order to make known to them the gift of His Everlasting Mercy. Once, there was a great famine that caused Naomi and her family to move from Bethlehem to Moab. Over time, Naomi’s two sons married Moabite women. After about ten years, Naomi’s husband and two sons died. Eventually, Naomi decided to move back to Bethlehem since the famine had ended. She told her son’s widows, Orpah and Ruth, to go back to their own people. Orpah eventually listened to Naomi, but Ruth would not leave. When they arrived in Bethlehem at harvest time, Ruth went to gather left-over barley from a nearby field. This field, providentially, belonged to Boaz, a relative of Naomi’s husband. Boaz heard about Ruth and her dedication to Naomi. Moved by her kindness and dedication, he told her to gather barley only from his field and offered her his protection. Boaz was a generous man and the two women did not go hungry. Naomi told Ruth that Boaz was one of their closest relatives. Traditionally, if a man died childless, his closest relative would marry the widow to hopefully produce an heir. At the end of the harvest, Ruth, at Naomi’s request, told Boaz that he was her next of kin and asked for his protection. Boaz promised to marry her if a man who was an even closer relative of Naomi’s refused. Every story in the Bible is connected somehow to the great plan of salvation. Two simple women – Rahab of Jericho (the mother of Boaz), and Ruth the Moabite (King David’s great-grandmother), both became important parts of Jesus’ family tree. This story should remind us that God uses every little event and every person to work things towards the good. Jesse Tree: What’s in a Name? 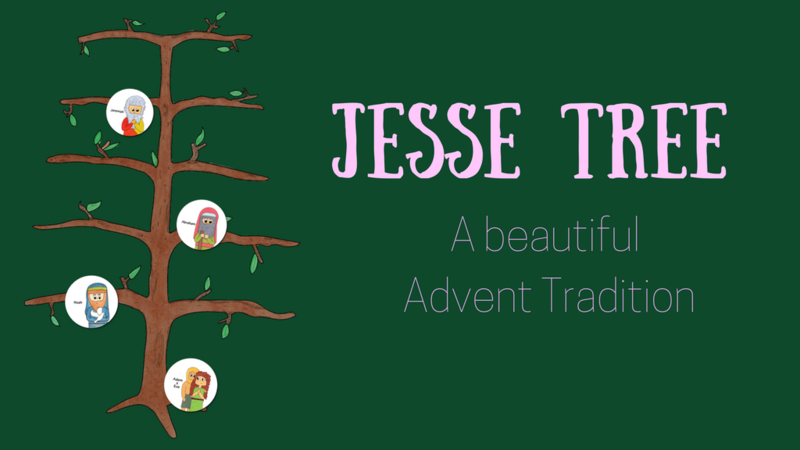 The Jesse Tree is an old Advent tradition and one that has its roots (pun intended) in scripture and tradition. The Jesse Tree is named after Jesse, the father of David, the great, Jewish king from the Old Testament. We are most likely all familiar with this passage, but it might be a little hard to understand why Jesse is being compared to a stump. Shoots or sprouts are signs of new life and hope. Jesus, as the descendant of David, and of Jesse, represents the new sprout – the new hope – the source of salvation. The concept of a Jesse Tree is similar to that of a family tree. It traces the story of salvation from creation until the Birth of Christ. The Jesse Tree originated in the medieval period. Originally, the focus was placed solely on the people involved. More recent versions focus on prophecies, events, and people leading up until the time of Christ. In a sense, it is a way for us to join the ancestors of Jesus in waiting and expectation of His coming. There is no better way to prepare room for Jesus in our hearts than by closely praying with and focusing on the great events leading up to our salvation. Looking at the whole Old Testament with its 46 books can be a little overwhelming to say the least. The Jesse Tree helps to break it down into bite-size pieces perfect for children, families, and all individuals. The Jesse Tree can also serve as a kind of Advent Calendar. This year we are especially excited about our new magnetic Jesse Tree! The first Jesse Trees appeared in art most likely during the medieval times. They began as tapestries, carvings, and stained glass windows in churches so that people who were illiterate could still have a chance to “read” the Bible and learn about the events leading up to the Birth of Christ. 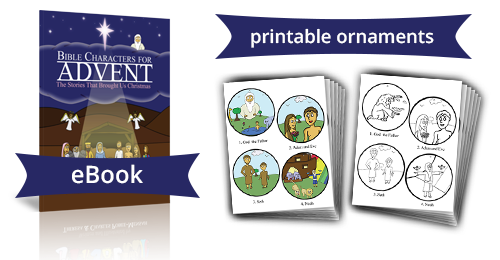 The Jesse Tree designs showed Jesus’ connection with Jesse and other important Biblical figures. A tree grew out of Jesse and on its branches were pictures of other ancestors of Jesus. The tree would then culminate with the figures of Jesus and Mary. The Cathedral of Chartres, in France, dating back to 1260, has a particularly famous and beautiful Jesse Tree stained glass window. Why Use a Jesse Tree? Advent is a time of joyful expectation. Using a Jesse Tree can help place the focus on the amazing faithfulness of God, our Father and Savior. The Jesse Tree encompasses over 4,000 years of history. The true faithfulness and love of God are seen in that rich history. He has kept the promise He made to Abraham and to every generation since then – to be present and faithful. God is here with us still and He always will be. My Jesse Tree Magnet Set!